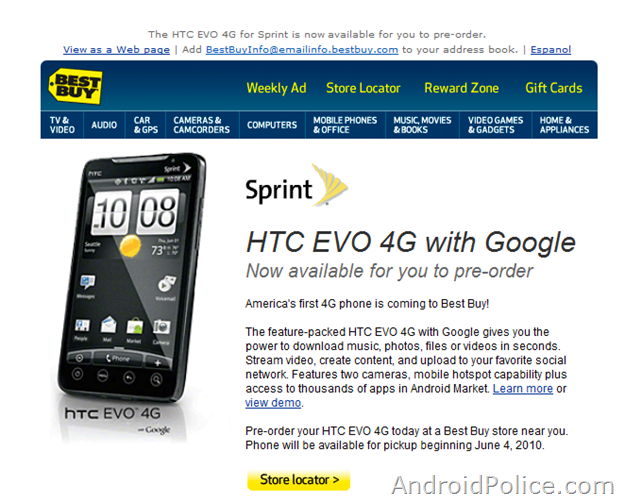 Best Buy announced minutes ago that the HTC EVO 4G, which was officially introduced by Sprint earlier today, is available for preorder from Best Buy stores effective immediately. It looks like the preorder is available strictly at Best Buy retail locations and not online on BestBuy.com, at least for now. The email makes no mention of the mandatory $10 monthly EVO usage fee that we reported on earlier, which is a sure recipe for some surprised and possibly not very happy customers about to head to Best Buy tomorrow. There is also no mention of how exactly the deal is going to be handled, though from our past experience, Best Buy will likely substitute any mail-in rebates with instant credits, and take a $50 preorder deposit in the form of a Best Buy gift card. America's first 4G phone is coming to Best Buy! The feature-packed HTC EVO 4G with Google gives you the power to download music, photos, files or videos in seconds. Stream video, create content, and upload to your favorite social network. Features two cameras, mobile hotspot capability plus access to thousands of apps in Android Market. Learn more or view demo. 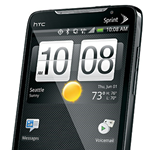 Pre-order your HTC EVO 4G today at a Best Buy store near you. Phone will be available for pickup beginning June 4, 2010. HTC EVO 4G: Phone requires a two-year Agreement and activation on select service plan and premium data buy-up. Optional Sprint Mobile Hotspot add-on required to access Wi-Fi on device. Coverage is not available everywhere. Sprint 4G is currently available in over 30 markets and counting and on select devices. See sprint.com/4G for details. Not all services available on 4G, and coverage may default to 3G/separate network where 4G is unavailable. Pricing, offer terms, fees and features may vary for existing customers not eligible for upgrade. Other restrictions apply. See store or sprint.com for details. Sprint and the logo are trademarks of Sprint. Other marks are the property of their respective owners. Who is getting their preorders tomorrow?